For its new production, Choreographic Shindig, the company founded by former Pacific Northwest Ballet dancer Olivier Wevers put out an international call for choreographers—and received 95 applicants. The company members chose three (from Texas, San Francisco and Switzerland) et voilà, the contemporary ballet party begins. 9/11–9/19. Erickson Theater Off Broadway, 1524 Harvard Ave.; 206.329.1050; whimwhim.org. Gender-bending duo Kitten N’ Lou bring their sparkly blend of burlesque, slapstick comedy and outrageous costumes to a new variety show, Overexposed, which finds the real-life couple pondering the regular old realities of married life. 9/17–9/19. Times and prices vary. Century Ballroom, West Hall, 915 E Pine St.; kittenandlou.com. 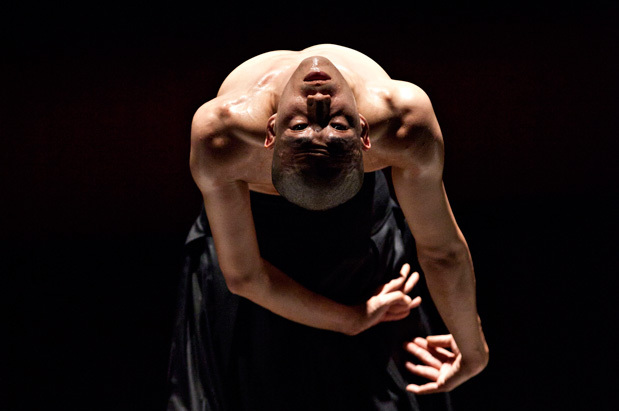 Are you butoh-curious? If you’ve always wondered about the Japanese dance form—with its bald heads, white body paint and painstakingly precise movement—you will have no finer an introduction than seeing Ushio Amagatsu’s world-renowned group. The North American premiere of Umusuna: Memories Before History involves sand pouring from the ceiling, corsets gored open and mouths agape. 10/1–10/3. Times and prices vary. Meany Hall, 4140 George Washington Lane NE; 206.543.4880; artsuw.org. One of Seattle’s true artistic treasures, Pat Graney never fails to think deeply about dance. For her new piece, Girl Gods, she explores female rage by way of physical frustration and mathematical choreography that resembles tantrums. At the work-in-progress showing of the piece last spring, viewers shifted from laughter to skin-prickling silence in an instant. 10/1–10/4. Times and prices vary. On the Boards, 100 W Roy St.; 206.217.9888; ontheboards.org. When it comes to performance, Minneapolis-based artist Emily Johnson thinks holistically. Raised in Alaska and of Yup’ik descent, she creates dance that is often more installation than choreography, and reaches a wider audience than the dance-going regulars. In Seattle, her performances begin outside and progress to the stage, and will be paired with community volunteerism, readings by Native American authors and a feast. 10/15–10/17. Times and prices vary. On the Boards, 100 W Roy St.; 206.217.9888; ontheboards.org. This London-based choreographer has never performed in the Northwest before, but is well known elsewhere for his seamless blend of contemporary movement with classical Indian dance. His company makes its debut with the captivating new piece Kaash, a gloriously fluid exploration of black holes, tablas and Hindu gods. 11/12–11/14. Times and prices vary. Meany Hall, 4140 George Washington Lane NE; 206.543.4880; artsuw.org. Local choreographer Maya Soto pairs with Seattle composer Nico Tower for a multi-media performance that combines spoken word, theater, video and contemporary dance—in spaaaaace! Called Inner Galactic, the piece spans sci-fi, Carl Sagan and matters of the human heart. 11/13–11/15. Times vary. $18–$20. Velocity Dance Center, 1621 12th Ave.; 206.325.8773; velocitydancecenter.org. Price Suddarth joined the Pacific Northwest Ballet (PNB) corps de ballet in 2011 and has already landed roles in Swan Lake, Roméo et Juliette and Sleeping Beauty. This month he proves his mettle as a choreographer, with a world premiere (yet to be named) on the PNB main stage (see “Emergence,” below), featuring a big cast and original music by Seattle’s Barret Anspach. Brangien Davis: What feelings leap to mind when you realize you are presenting a world premiere at PNB? Price Suddarth: Ecstatic, eager, blessed. And, depending on when you ask me, nervous. BD: How do you get a grip on the nerves? PS: Deep breathing…and going over the steps. BD: Describe the movement in your new piece. PS: Sleek, flowy, fast, exciting. BD: What will count as success? PS: For me, success is creating the ballet I want to make. If I feel as if I have put a piece of myself on the stage, I will be happy. Still kicking yourself for skipping that dance performance everyone was buzzing about last year? Make amends with these return engagements. The local performer’s one-woman show spins an enchanting tale of strip clubs, the aging process and Lotan Baba, the rolling saint of India. Alternately harrowing and hilarious, it’s accompanied by a gorgeous live cello score. 9/3–9/4. 8 p.m. $12–$20. Velocity Dance Center, 1621 12th Ave.; 206.325.8773; velocitydancecenter.org. The Seattle choreographer and UW grad presents an evening of jazz-inspired dance, featuring five works performed to live music composed by local trumpet virtuoso Samantha Boshnack. 10/23–10/25. Times and prices vary. Velocity Dance Center, 1621 12th Ave.; 206.325.8773; velocitydancecenter.org. KT Niehoff and featuring a cast of fine, very feathery friends. Don your most flamboyant get-up and join the fun. 10/30–11/14. Times and prices vary. ACT Theatre, 700 Union St.; 206.292.7676; acttheatre.org. Emergence is an impressive mixed bill at Pacific Northwest Ballet, including work by Jessica Lang, PNB’s own Kiyon Gaines and Price Suddarth (see above). It’s also the title of a can’t-miss-twice modern ballet by Crystal Pite of Vancouver, B.C., a dark swarm of insect-like legs and fluttery, flicky movement. 11/6–11/15. Times and prices vary. Pacific Northwest Ballet, 301 Mercer St.; 206.441.2424; pnb.org. When Seattle-grown choreographer Mark Morris premiered A Wooden Tree at On the Boards in 2012, the 14 funny, folksy dances set to ditties by Scottish humorist and songwriter Ivor Cutler earned deserved raves. Also on the bill: Morris’ remarkable Cargo, Whelm and The. 11/20–11/22. Times and prices vary. The Moore Theatre, 1932 Second Ave.; 206.682.1414; stgpresents.org. Explore more 2015 Fall Arts events here.